Parcels are available for CDH 4.1.3 or later, and for Impala, Search, Spark, Accumulo, Kafka, Key Trustee KMS, and Sqoop Connectors. To enable upgrades and additions with minimal disruption, parcels participate in six phases: download, distribute, activate: deactivate, remove, and delete. Downloading a parcel copies the appropriate software to a local parcel repository on the Cloudera Manager Server, where it is available for distribution to the other hosts in any of your clusters managed by this Cloudera Manager Server. You can have multiple parcels for a given product downloaded to your Cloudera Manager Server. Once a parcel has been downloaded to the Server, it will be available for distribution on all clusters managed by the Server. A downloaded parcel will appear in the cluster-specific section for every cluster managed by this Cloudera Manager Server. Distributing a parcel copies the parcel to the member hosts of a cluster and unpacks it. Distributing a parcel does not actually upgrade the components running on your cluster; the current services continue to run unchanged. You can have multiple parcels distributed on your cluster. Note: The distribute process does not require Internet access; rather the Cloudera Manager Agent on each cluster member downloads the parcels from the local parcel repository on the Cloudera Manager Server. Activating a parcel causes the Cloudera Manager to link to the new components, ready to run the new version upon the next restart. Activation does not automatically stop the current services or perform a restart — you have the option to restart the service(s) after activation, or you can allow the system administrator to determine the appropriate time to perform those operations. Deactivating a parcel causes Cloudera Manager to unlink from the parcel components. A parcel cannot be deactivated while it is still in use on one or more hosts. Removing a parcel causes Cloudera Manager to remove the parcel components from the hosts. Deleting a parcel causes Cloudera Manager to remove the parcel components from the local parcel repository. Cloudera Manager detects when new parcels are available. The parcel indicator in the Admin Console navigation bar ( )indicates how many parcels are eligible for downloading or distribution. For example, CDH parcels older than the active one do not contribute to the count if you are already using the latest version. If no parcels are eligible, or if all parcels have been activated, then the indicator will not have a number badge. You can configure Cloudera Manager to download and distribute parcels automatically, if desired. 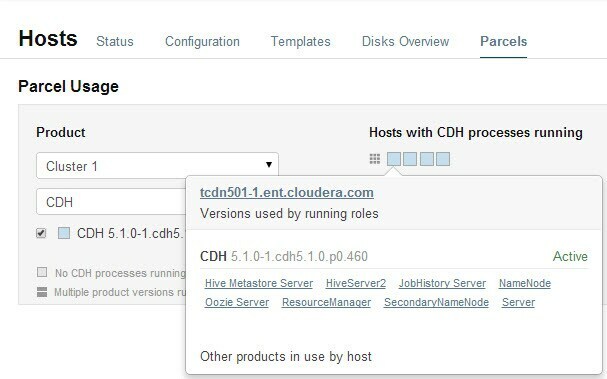 Important: If you plan to upgrade CDH you should follow the instructions in Upgrading CDH and Managed Services Using Cloudera Manager because steps in addition to activating the parcel must be performed in order to successfully upgrade. The default location for the local parcel directory on the Cloudera Manager Server host is /opt/cloudera/parcel-repo. To change this location, follow the instructions in Configuring Cloudera Manager Server Parcel Settings. The default location for the distributed parcels on the managed hosts is /opt/cloudera/parcels. 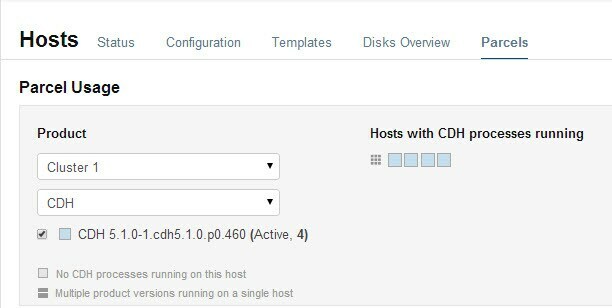 To change this location, set the parcel_dir property in /etc/cloudera-scm-agent/config.ini file of the Cloudera Manager Agent and restart the Cloudera Manager Agent or by following the instructions in Configuring the Host Parcel Directory. The Parcels page is divided into several sections. The top section, labeled Downloadable, shows you all the parcels that are available for download from the configured parcel repositories. Below the Downloadable section, each cluster managed by this Cloudera Manager Server has a section that shows the parcels that have been downloaded, distributed, or activated on that cluster. When you download a parcel, it appears under every cluster, if you are managing more than one. However, this just indicates that the parcel is available for distribution on those clusters — in fact there is only one copy of the downloaded parcel, residing on the Cloudera Manager Server. Only after you distribute the parcel to a cluster will copies of it be placed on the hosts in that cluster. Click the parcel indicator in the top navigation bar. This takes you to the Hosts page, Parcels tab. By default, any parcels available for download are shown in the Downloadable section of the Parcels page. Parcels available for download will display a Download button. If the parcel you want is not shown here — for example, you want to upgrade to version of CDH that is not the most current version — you can make additional remote parcel repositories available through the Administration Settings page. You can also configure the location of the local parcel repository and other settings. See Parcel Configuration Settings. Click Download to initiate the download of the parcel from the remote parcel repository to your local repository. When the parcel has been downloaded, the button label changes to Distribute. 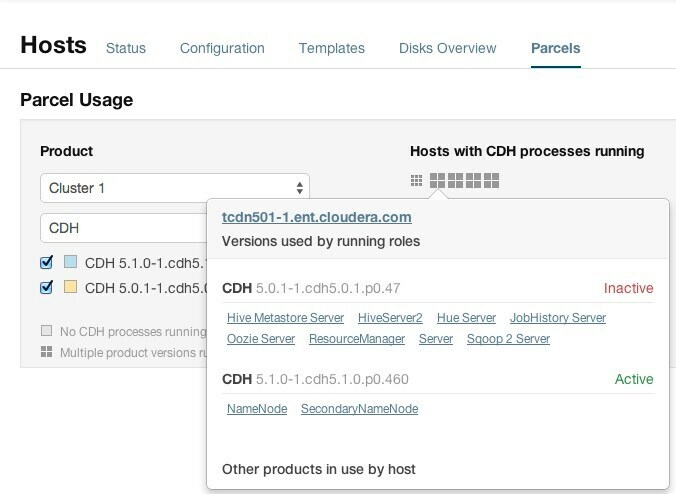 Note: The parcel download is done at the Cloudera Manager Server, so with multiple clusters, the downloaded parcels are shown as available to all clusters managed by the Cloudera Manager Server. However, distribution (to a specific cluster's hosts) must be selected on a cluster-by-cluster basis. Parcels that have been downloaded can be distributed to the hosts in your cluster, available for activation. From the Parcels tab, click the Distribute button for the parcel you want to distribute. This starts the distribution process to the hosts in the cluster. Distribution does not require Internet access; rather the Cloudera Manager Agent on each cluster member downloads the parcel from the local parcel repository hosted on the Cloudera Manager Server. If you have a large number of hosts to which the parcels should be distributed, you can control how many concurrent uploads Cloudera Manager will perform. You can configure this setting on the Administration page, Properties tab under the Parcels section. You can delete a parcel that is ready to be distributed; click the triangle at the right end of the Distribute button to access the Delete command. This will delete the downloaded parcel from the local parcel repository. Distributing parcels to the hosts in the cluster does not affect the current running services. Parcels that have been distributed to the hosts in a cluster are ready to be activated. From the Parcels tab, click the Activate button for the parcel you want to activate. This will update Cloudera Manager to point to the new software, ready to be run the next time a service is restarted. A pop-up warns you that your currently running process will not be affected until you restart, and gives you the option to perform a restart. If you do not want to restart at this time, click Close. If you elect not to restart services as part of the Activation process, you can instead go to the Clusters tab and restart your services at a later time. Until you restart services, the current software will continue to run. This allows you to restart your services at a time that is convenient based on your maintenance schedules or other considerations. Activating a new parcel also deactivates the previously active parcel (if any) for the product you've just upgraded. However, until you restart the services, the previously active parcel will have the link Still in use and you will not be able to remove the parcel until it is no longer being used. Note: Under some situations, such as doing a major release upgrade (for example, CDH 4 to CDH 5) additional upgrade steps may be necessary. In this case, instead of Activate, the button may instead say Upgrade. This indicates that there may be additional steps involved in the upgrade. You can deactivate an active parcel; this will update Cloudera Manager to point to the previous software version, ready to be run the next time a service is restarted. To deactivate a parcel, click Actions on an activated parcel and select Deactivate. To use the previous version of the software, go to the Clusters tab and restart your services. Note: If you did your original installation from parcels, and there is only one version of your software installed (that is, no packages, and no previous parcels have been activated and started) then when you attempt to restart after deactivating the current version, your roles will be stopped but will not be able to restart. To remove a parcel, click the down arrow to the right of an Activate button and select Remove from Hosts. To delete a parcel, click the down arrow to the right of a Distribute button and select Delete. If you experience an error while performing parcel operations, click on the red 'X' icons on the parcel page to display a message that will identify the source of the error. If you have a parcel distributing but never completing, make sure you have enough free space in the parcel download directories, as Cloudera Manager will retry to downloading and unpacking parcels even if there is insufficient space. Click Hosts in the top navigation bar and click the Parcels tab. Click the Parcel Usage button. This page only shows the usage of parcels, not components that were installed as packages. If you select a cluster running packages (for example, a CDH 4 cluster) the cluster is not displayed, and instead you will see a message indicating the cluster is not running parcels. If you have individual hosts running components installed as packages, they will appear as "empty." You can view parcel usage by cluster, or by product. You can also view just the hosts running only the active parcels, or just hosts running older parcels (not the currently active parcels) or both. The "host map" at the right shows each host in the cluster with the status of the parcels on that host. If the host is actually running the processes from the currently activated parcels, the host is indicated in blue. A black square indicates that a parcel has been activated, but that all the running processes are from an earlier version of the software. This can happen, for example, if you have not restarted a service or role after activating a new parcel. Move the cursor over the icon to see the rack to which the hosts are assigned. Hosts on different racks are displayed in separate rows. To view the exact versions of the software running on a given host, you can click on the square representing the host. This pops up a display showing the parcel versions installed on that host. For CDH 4.4, Impala 1.1.1, and Solr 0.9.3 or higher, the pop-up lists the roles running on the selected host that are part of the listed parcel. Clicking a role opens the Cloudera Manager page for that role. It also shows whether the parcel is active or not. If a host is running various software versions, the square representing the host is a four-square icon . When you move the cursor over that host, both the active and inactive components are shown. For example, in the image below, the older CDH parcel has been deactivated, but only the HDFS service has been restarted. You can configure where parcels are stored on the Cloudera Manager Server host, the URLs of parcel repositories, the properties of a proxy server through which parcels are downloaded, and where parcels distributed to cluster hosts are stored. Local Parcel Repository Path defines the path on the Cloudera Manager Server host where downloaded parcels are stored. Remote Parcel Repository URLs is a list of repositories that Cloudera Manager should check for parcels. Initially this points to the latest released CDH 4, CDH 5, Impala, and Solr repositories but you can add your own repository locations to the list. You can use this mechanism to add Cloudera repositories that are not listed by default, such as older versions of CDH, or the Sentry parcel for CDH 4.3. You can also use this to add your own custom repositories. The locations of the Cloudera parcel repositories are https://archive.cloudera.com/product/parcels/version, where product is cdh4, cdh5, gplextras5, impala, search, and sentry, and version is a specific product version or latest. Enter the path to the repository. Set the frequency with which Cloudera Manager will check for new parcels. Configure a proxy to access to the remote repositories. Configure whether downloads and distribution of parcels should occur automatically whenever new ones are detected. If automatic downloading/distribution are not enabled (the default), you must go to the Parcels page to initiate these actions. Control which products can be downloaded if automatic downloading is enabled. Control whether to retain downloaded parcels. You can configure the bandwidth limits and the number of concurrent uploads, to tune the load that parcel distribution puts on your network. The defaults are up to 50 concurrent parcel uploads and 50 MiB/s aggregate bandwidth. The concurrent upload count (Maximum Parcel Uploads) doesn't matter, theoretically, if all hosts have the same speed Ethernet. In general, 50 concurrent uploads is an acceptable setting in most cases. However, in a scenario where the server has more bandwidth (say 10Gbe while the normal hosts are using 1Gbe), then the count is important to maximize bandwidth, and would need to be at least the difference in speeds (10x in this case). The bandwidth limit (Parcel Distribution Rate Limit) should be your Ethernet speed (in MiB/seconds) divided by approximately 16. You can use a higher limit if you have QoS set up to prevent starving other services, or if you are willing accept a higher risk of higher bandwidth load. To configure a proxy server through which parcels are downloaded, follow the instructions in Configuring Network Settings.